ALI AL SALEM AIR BASE, KUWAIT -- Sometime last April, New York Army National Guard Lt. Col. Russell Clark, other U.S. Soldiers, and members of the Dand District Afghan National Police found their first target -- a field of purple-white, oddly beautiful opium poppy plants. The police and Soldiers had stolen a march on the harvest, securing the field before anyone could incise the plants’ seed pods and collect the milky white gum seeping forth -- the raw material for heroin. Shouldering their rifles and wielding long sticks like golf clubs, the police officers walked the field for hours, winnowing the pods from the plants, said Clark, an Angola, N.Y. resident. Under the mentorship of Clark and his Soldiers, the Dand District Afghan National Police (ANP), would find and secure many acres of opium poppies and eradicate them in the same manner. With the assistance of other Soldiers specially trained in agriculture, the citizens of Dand would see a change in crops through to fruition. These are some of the paradoxical but ultimately successful missions the police and the Soldiers are performing under the threat of IEDs and the shadow of so-called "green on blue" killings, Clark recalled when interviewed here. Clark gives most of the credit for these victories to the district ANP, whom he describes as efficient officers committed to change. They have become a stronger and more responsive presence in the district villages, he said. Though the green-on-blue killings have led to greater restrictions, Clark expressed great confidence in the ANP officers. "They lead the way on every operation," Clark said. "I trail behind with the leadership." A New York State corrections officer in his civilian life, Clark deployed to Afghanistan with another group of Army National Guard Soldiers, most of whom hail from New York, in February and March. Soon after arriving, he and five other New York Army National Guard Soldiers -- two of whom also have police experience -- were picked to assist the ANP in Dand and two neighboring districts south of Khandahar City, Clark said. "Because of our law-enforcement backgrounds, we head up the mentoring in these districts," Clark said of the two Soldiers. The Soldiers were assigned to Task Force Arrowhead under the 3rd Brigade Combat Team, 2nd Infantry Division. Clark began working closely with Maj. Rahmatullah, the Dand District ANP commander. "I have dinner with him every night," Clark said. Clark and the Soldiers also found themselves in a predominantly flat countryside, interlaced with canals and wadis, arid but for trenches irrigating many rural farms. They set about to help Rahmatullah and his police officers achieve their first goal -- eradicating the district’s opium poppy crop. Their first foray could’ve ended for some of them shortly after it started, Clark recalled. 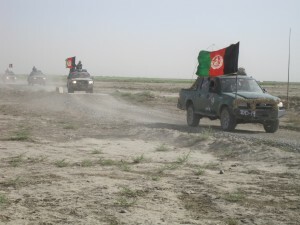 On the way to the first poppy field, Afghan National Army soldiers working with them found and eliminated three IEDs before they had a chance to explode, Clark said. Later on, the Dand District police officers would go on to make many such discoveries, he added. A sea of green dotted with purple-white poppy flowers, the field was a fantastic sight which reminded the Soldiers of "The Wizard of Oz," Clark said. "It was a beautiful field," he recalled. "They were just blossoming. We got it just in time." There was no tractor available to destroy the plants, so the ANP simply whittled sticks and used them to hack the seed pods off -- a process which took hours, Clark said. "So they just did it by hand, the old-fashioned way...like locusts descending on a field," he recalled. Braving IEDs and other dangers, they would repeat this process many times between mid-April and mid-May, Clark recalled. Aerial surveillance and the ANP’s own intelligence information, or intel, later showed that the officers had wiped out the Dand district’s entire poppy crop, he added. This sowed the seeds for the next wave of change -- replacing the poppies with marketable, legal, profitable and traditional crops. Helped by a Kentucky Army National Guard agricultural team, the farmers put in winter wheat, then moved on to grow cantaloupes and honeydew melons, Clark said. "We’re trying to give them good cash crops," Clark said. "Afghanistan is famous for its melons, pomegranates, grapes and raisins." None of this would’ve been possible without the security established by the police, and the growing strength of village-police relations, he said. "Ninety percent of what we’re doing is community-based policing," Clark said. That strength of these relations is rooted in the efficiency of the police, who, guided by the American Soldiers, routinely conduct cordon-and-search operations in the villages, then sit down to meet with the village elders, Clark said. The immediate task of these operations is to find wanted criminals or insurgents, contraband like illegal drugs or weapons, and IED factories, he explained. But the long-term goal, he stressed, is to train the police in evidence-based investigations and prosecutions, and build police presence in the villages. "They’re good at fighting," Clark said of the ANP. "They can go into a village, cordon it off and clear it in no time." There have been few serious incidents during these operations, something he also attributes to the ANP’s speed and good use of intel. Rolling down the district’s narrow, rutted dirt roads in Ford Ranger trucks, the police will surround a village, secure it and then go through it, knocking on doors and asking questions, Clark explained. The meetings with the village elders, known as key leader engagements (KLE), are part and parcel of counter-insurgency operations, he stressed. "That’s huge," Clark said. "After a clearing operation, we sit down and have a KLE. You go in on high alert, and the next thing you know, you’re sitting down, drinking tea." These good relations have also led villagers to serve up fresh intel, helping the police find countless IEDs -- including on routes the police and soldiers use -- thus saving lives, Clark said. Clark said the village elders also help the police walk the line between modern law and Sharia, the Islamic law based on the Koran. "If it’s within a tribe, it’s handled by Sharia law," Clark said. "If it’s between tribes, it’s pushed up to the police." The ANP investigate the whole scope of crimes, including murder, he added. Though he hasn’t lost any troops, four police officers were killed in small-arms and IED attacks since he arrived, Clark said. But Rahmatullah’s response to the attacks showed his true mettle, Clark said. He described Rahmatullah’s leadership style as a legacy of the old top-down Soviet doctrine. "He definitely rules with an iron fist," Clark said. Rahmatullah investigated the attacks, determined they could have been prevented with better patrolling and disciplined the officers responsible, he recalled. Along with consistency of district leadership, hiring police from the villages has also built an atmosphere of familiarity and mutual trust, Clark added. "This is what makes Dand stand out ahead of the other districts," Clark said, crediting his American Army and Canadian Army predecessors for their groundwork. "Dand was already on its way to the next level of transition." That transition involves the police taking over all district law-enforcement, allowing the Afghan National Army to assume more of the role it’s designed for -- homeland defense, Clark said. But before that happens, the police will have to improve their long-term planning and become more self-sufficient in logistics and supply. Their mentorship of the police in these areas continues, Clark said. "We’re trying to set them up for the future," he said.